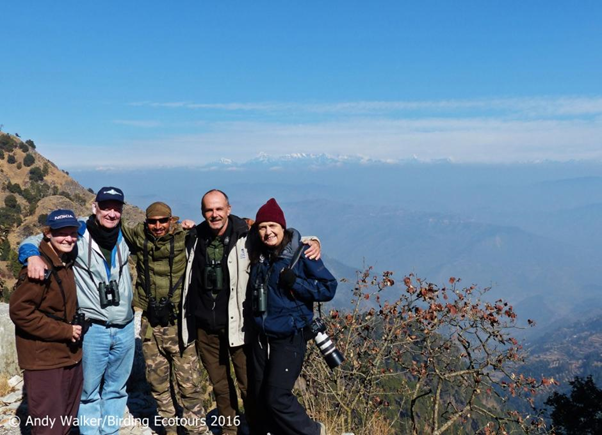 This January (2016), Andy Walker led our 15-day Birding Tour India: Birds, Tigers and the Himalayas. Here Andy provides a brief summary of the tour. Click this link to be taken to the full trip report. 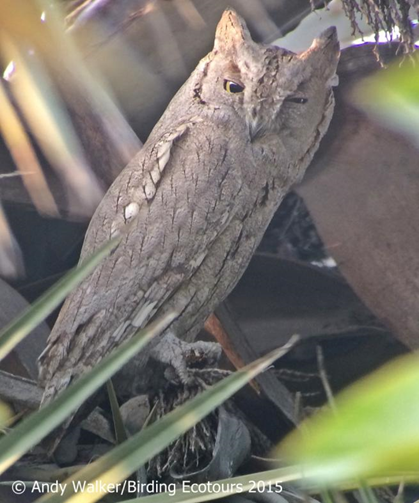 The tour commenced with our expert local guide Ganesh in New Delhi on the 3rd of January 2016, where we kicked off with finding a rarity – Pallid Scops Owl. 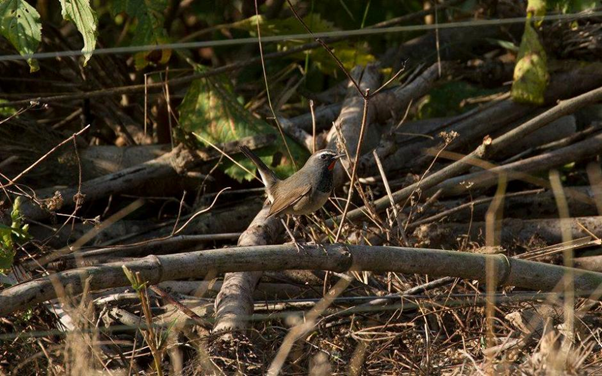 The first record for the Okhla Bird Sanctuary/Delhi area! We also got up and running with numerous common birds that would become very familiar, such as Indian Peafowl, White-throated Kingfisher, Rufous Treepie, and Oriental Magpie-Robin. Several restricted-range species were also found on this first day: White-tailed Stonechat, Striated Grassbird, and Striated Babbler, along with numerous herons, ducks, and birds of prey (raptors). After the excitement in New Delhi we headed straight down to Ranthambhore National Park on the iconic Indian railway system for a few days in search of the area’s wildlife. We met up with our expert local guide Shyam, who stayed with us for the duration of the tour, and we soon connected with one of our main targets during a jeep safari, the impressive Bengal tiger. We had fantastic views of a huge tigress at close range as she offered up very good photographic opportunities. 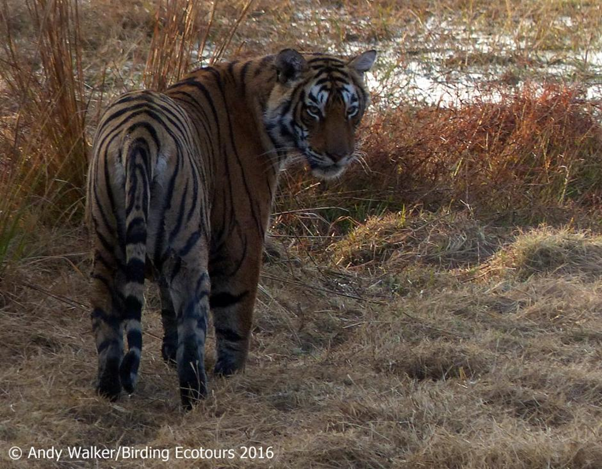 More photos of this impressive tiger encounter can be found in our Indian Gallery. While in the Ranthambhore area (after enjoying great views of the tiger) we found lots of our target birds too, such as Painted Spurfowl, Painted Sandgrouse, Indian Skimmer, Small Pratincole, Indian Vulture, Great Thick-knee, Greater Painted-snipe, Brown Crake, and White-naped Woodpecker. We also saw jungle cat, golden jackal, and more! We then continued our journey around the Golden Triangle of India to Keoladeo Ghana National Park, formerly known as Bharatpur Bird Sanctuary. We spent a couple of days birding this magnificent area and finding a huge number of species, particularly wildfowl, waders, and Indian birds of prey (raptors). Some highlights included Indian Courser, Black Bittern, Black-necked Stork, Sarus Crane, Siberian Rubythroat, Bluethroat, Tickell’s Thrush, and Citrine Wagtail, among many others. A huge Indian python proved very popular! A visit to this part of northern India would not be complete without taking in the majestic UNESCO World Heritage Sites of Fatehpur Sikri and the Taj Mahal, and so we called in to these very impressive places to soak up the sights, sounds, and smells on our way to the Chambal River. A delightful cruise along the peaceful Chambal River gave great views of two species of crocodile: mugger, and the Critically Endangered (IUCN) gharial, with some very large individuals seen. Top birds seen here included River Lapwing, Black-bellied Tern, River Tern, Bar-headed Goose (a spectacular sight of a flock coming in to land next to us), Brown Hawk-Owl, Sirkeer Malkoha, White-capped Bunting, and the list could go on! It was by now time to head into the Himalayan foothills for more birding, so we left Delhi on the overnight train to Sattal. One of the best days of the entire two-week birdwatching tour greeted us. We had numerous new birds and many highlights, such as Long-billed Thrush, Spotted and Slaty-backed Forktails, Golden Bush Robin, Himalayan Bluetail, Himalayan (White-tailed) Rubythroat, Siberian Rubythroat, Striated Laughingthrush, and Rufous-breasted Accentor. Take a look at days 8 and 9 on the trip report for a who’s who of what we saw on this brilliant day and the similarly exciting next day! 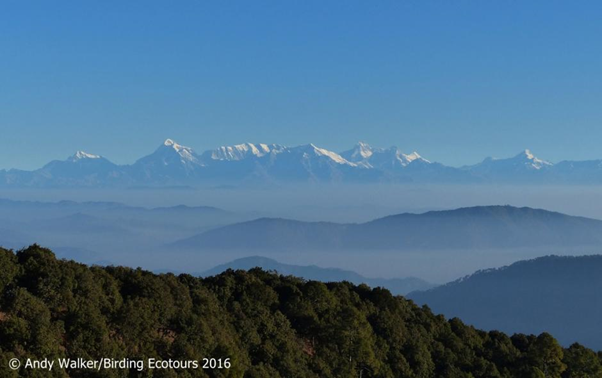 Soon it was time to gain some altitude, and in doing so we got spectacular Himalayan views from the Pangot area. To see the staggering sight of the Himalayan mountain range and the highest peaks of India is simply breathtaking and a memory that will not disappear for a long time, if ever! There were some incredible birds in this area, and we saw numerous species close to our comfortable mountain guest house. Our highlights here included Cheer Pheasant, Koklass Pheasant, Kalij Pheasant, Hill Partridge, Bearded Vulture, Himalayan (Griffon) Vulture, (Eurasian) Griffon Vulture, Rufous-bellied Woodpecker, Himalayan Woodpecker, Scaly-bellied Woodpecker, Black-headed Jay, Himalayan Bluetail, Altai Accentor, and numerous other exciting passerines (lots of laughingthrushes). 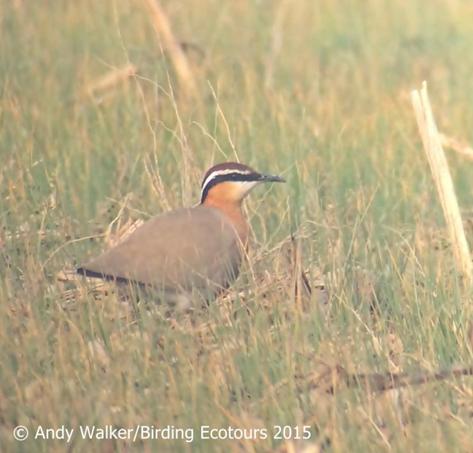 We also bumped into Arjan Dwarshuis twelve days into his quest to see the most species in the world in a year. Good Luck, Arjan! After some mid- and high-elevation birding we dropped down to the Kosi River and then Corbett National Park, where the high-quality and exciting birding continued with Ibisbill, River Lapwing, Red-headed Vulture, Cinereous (Eurasian Black) Vulture, (Eurasian) Griffon Vulture, Collared Falconet, Great Hornbill, Blue-bearded Bee-eater, Brown Dipper, Little Forktail, Wallcreeper, and Crimson Sunbird. 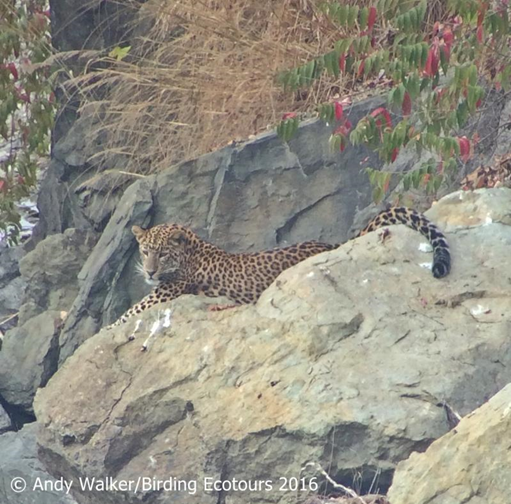 It wasn’t just birds here, though, as we saw Asian elephants and another trip highlight in Indian leopard, as well as a number of other game species. Leaving the Himalayan foothills we drove back to Delhi for our final stop, a small wetland that produced many new birds for our trip, including Spotted Crake, Baillon’s Crake, Yellow Bittern, Indian Reed Warbler, Moustached Warbler, and Paddyfield Warbler, along with a wide range of wildfowl, waders, and raptors. We recorded a total of 401 bird species during the tour, along with an impressive list of other animals, including such emblematic species as Bengal tiger, Indian leopard, Asian elephant, gharial, and Indian python, and the less well-known but equally exciting Indian long-eared hedgehog, Indian crested porcupine, Himalayan agama, and a range of beautiful butterflies. Complete species lists can be found here. Indian wildlife gallery can be found here. 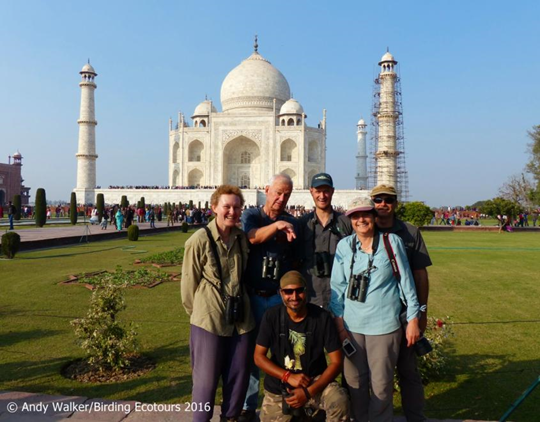 India is about more than just its wildlife, and during our tour we met a lot of very nice people, sampled some amazing food, and visited some seriously impressive natural and man-made landscapes. Seeing the Himalayas or the Taj Mahal for the first time is an equally breathtaking feeling, for totally different reasons. The sights, smells, and sounds of India will remain with us for a long while after this great trip. For details of the 2019 India Tour please follow this link. For the 2016 Trip Report please follow this link. 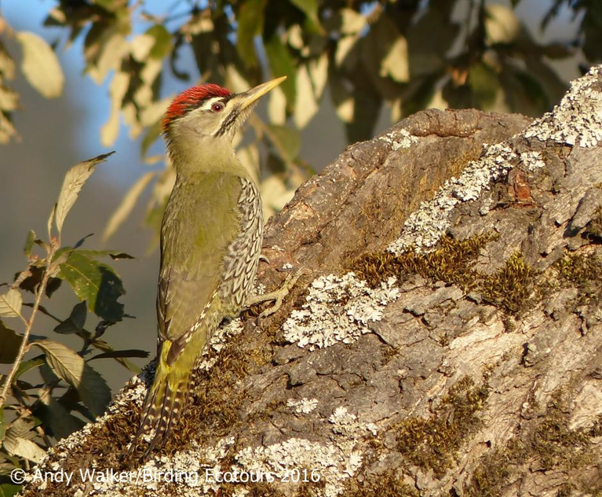 We also offer birding trips to Assam and are planning a birding tours to the Western Ghats and Gujarat. Please contact us for details. If you’d like any further information, please drop us an email.